This pattern is available from etsy.com for $7.95. 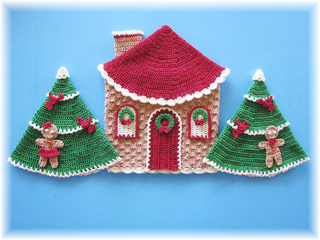 I have always loved gingerbread men and little gingerbread cottages. Every year my grandchildren and I get together for a day of baking Christmas cookies. We always have so much fun; it is a cherished tradition I look forward to all year. But I have to admit, I really am much better at crocheting than I am at baking. 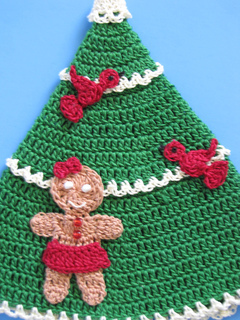 And with that in mind, I decided to put my crocheting talents to work and create a little gingerbread cottage, and a cute couple of gingerbread kids to go along with it. The result was this delightful set, Christmas in Gingerbread Land. This pattern is in PDF format so you will need to be able to open Adobe Acrobat, and prints out to 10 pages. I use a large font for easier reading and add lots of pictures. Important notice: Please remember, that while these designs are traditionally called “pot holders” they are intended to be used as decorative items only. The size 10 thread from which they are made is not thick enough to protect you from burns. Please do not use them to handle hot items, or to protect surfaces from hot pots or pans. Skill Level: Intermediate. 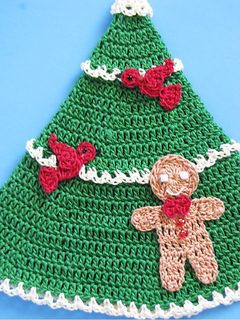 This is a clearly written and easy to follow pattern, but intermediate level crochet knowledge is recommended. Instructions for special stitches are included. 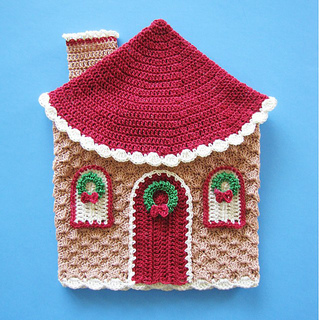 Size: The Cottage is about 8” high x 6 ½“ wide.